We’re happy to advertise events in which our members are taking part, provided that they have some general musical or theatrical interest, and to showcase shows and concerts being run by other local societies. All we need is to have information and an image, and preferably also a web link. If you have an event to share, please email Martin. Kirkcaldy Orchestral Society, Fife’s Community Orchestra, has two March concerts (7.30pm on Friday 22 March at Waid Academy, Anstruther and at 3.00pm on Sunday 24 March in the Old Kirk, Kirkcaldy. 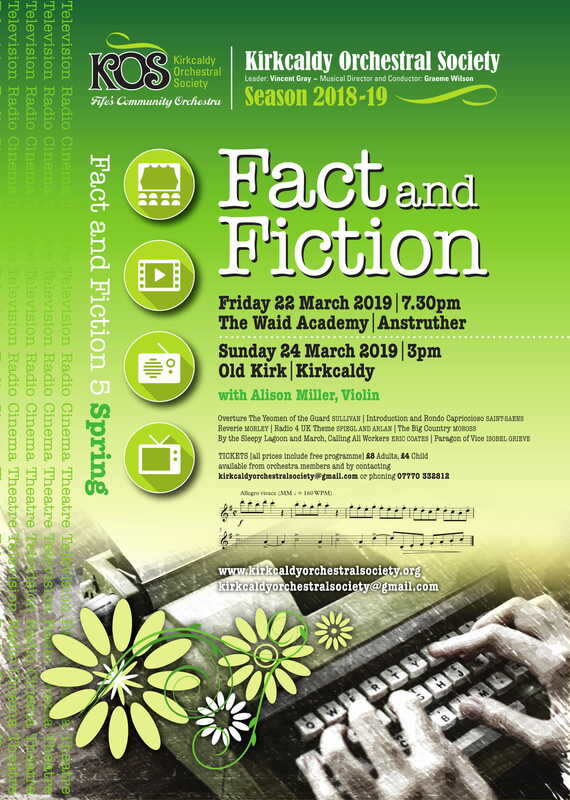 The concerts continue the themed title of ‘Fact and Fiction’, a season of programmes influenced by stage, screen, radio, theatre and general media, and these Spring concerts feature local violinist Alison Miller as a soloist. The music being played includes The Yeomen of the Guard Overture, the Introduction and Rondo Capriccioso by Saint-Saens, Autumn Leaves, some favourites from Radio 4/Home Service, The Big Country, and a work – Paragon of Vice – commissioned from a young composer, Isobel Grieve, from Inverkeithing Academy. Tickets now on sale from Ellen Patrick, who says it is a varied programme and great fun to play! Please come and support the eight members of our orchestra for The Sorcerer who are in KOS. Further details on the poster linked to the image.